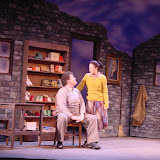 The Cripple of Inishmaan is a strange comic tale in the great tradition of Irish storytelling. Set in 1934, on a remote island off the west coast of Ireland, the play tells the story of Cripple Billy, a young lad who longs to break away from the tedium of his daily life. When a Hollywood director arrives on a neighboring island to make his latest movie, Billy is determined to be its star, and he will risk everything for his chance at fame and fortune. Poignant, poetic, and full of surprises, The Cripple of Inishmaan is a beautiful and haunting little play with all the clarity and power of a fable. Don’t miss it! This production contains adult language and subject matter, and is intended for mature audiences.